Esther will graduate Uhuru Academy in 2018. She has ten brothers and sisters, and lives with her aunt in Vumilia Resettlement Village. She came to live with her aunt after the post-election violence of 2008. When she grows up, she would like to be a judge who is just and fair to all people. She is a generous person who likes to share with others. 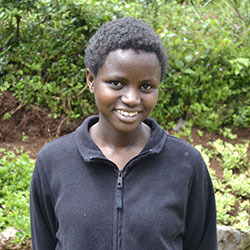 She loves the way students treat each other at Uhuru Academy, noting that the love and support will help her succeed. She knows that this educational opportunity will help her to achieve her dreams.